Providing an efficient heating system the IBC jacket is ideal for reducing the viscosity of a variety of products including fats, oils and foodstuffs. Suitable for 1000 litre IBC's and 270 Gallon totes for bulk storage of liquids: Heating Jacket warms up rapidly and provides even heat. Two high power heating circuits enable the top and bottom of each jacket to be separately controlled with integrated thermostats. The IBC heater is used throughout the world in a multitude of industries from pharmaceutical to chemical, cosmetic to food, the IBC heater is the ideal solution for heating liquid materials stored in intermediate bulk containers. Suitable for all types of IBC this heater jacket has quick release adjustable buckles for ease of installation and removal and is designed with upper and lower heat zones, each with separate thermostatic control. This allows for the upper heating zone to be switched off once the content level has fallen below half way. Unlike expensive conventional ovens, the heater jacket allows the IBC to be heated at its point of use. 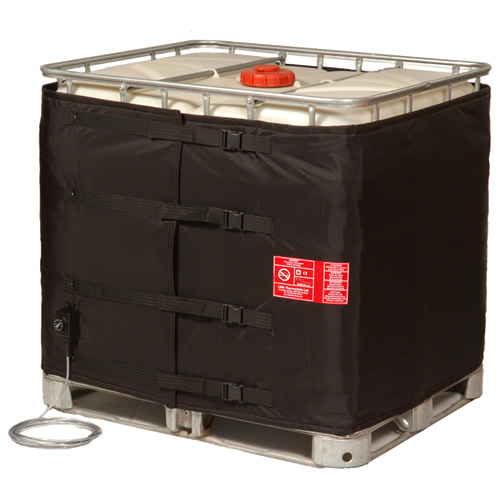 Once heated the IBC can be moved with the jacket in position and still maintain the temperature for longer thanks to the high efficiency thermal insulation. With 1000 watts per zone and an optional insulation lid the heater jacket offers a cost effective way of heating IBC’s. Some products simply require warming to avoid winter freezing, or reduce viscosity. The single circuit heating jacket is a cost effective alternative when the faster heating times are not required. Standard sizes for all types are designed to fit Industry Standard containers (thus have an adjustable length of 4060-4310mm and are 950mm wide). The IBC heater is designed to heat products stored in 1000 litre intermediate bulk containers. The IBC is an insulated heater jacket, which covers all four sides of the IBC and has an optional insulated lid.